CG Online Tutorials | Autodesk Inventor - Modeling - Tutorials - How to use holes wizard in Autodesk Inventor? Welcome to CG Online Tutorials - This is Autodesk Inventor Modeling tutorial category web page and you can find link of a useful Autodesk Inventor Modeling tutorials regarding How to use holes wizard in Autodesk Inventor, hosted in other web sites. If you want to suggest a tutorial please do contact us, you can find our email address at the bottom of the web page. 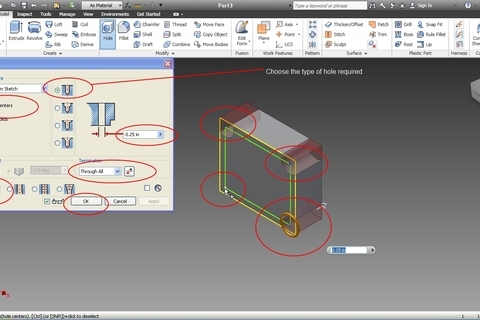 Autodesk Inventor Modeling Tutorials - How to use holes wizard in Autodesk Inventor? In this short tutorial the author Abhijeet will show a beginner to use holes wizard in Autodesk Inventor.